Last week the weather finally allowed us to get outside! Mema did a whole bunch of gardening as I kept the kids happy. (Thanks, Mema!). Our tulips and other various bulbs in the front yard are coming up. I am dying to get into the back yard and plant the garden, too. Now we are back to rain, but I can't wait for the sun to come back out. Being able to get the kiddos out for some fresh air sure makes the day go a lot more smoothly. Adalyn is in LOVE with her exersaucer. Every day I can tell her legs are getting stronger and she is figuring out how to play with more toys on it. We have been cloth diapering for about 3 months now. It certainly took some getting use to and was harder at first than disposable diapers. I am very happy we stuck with it though and now that I have a system to it and can go about 3-4 days between washes I love using them!! We are still using disposable at night. But I anticipate after we run out of what we currently have on hand, I will be giving cloth diapers a try at night. My favorite cloth diaper is the G diaper. They are not as bulky as all the other diapers I have tried. I love the versatility of them. With the insert I think you get a lot more use out of the diaper cover. The one thing I don't like about them is that they velcro in the back. I know it is because some kids try to take off their diapers, but mine never did. I just find it more difficult to do it that way. My 2nd favorite cloth diaper would be the basic cloth diaper with a cover like Thirsties. I made about 24 flannel cloth wipes to use rather then disposable wipes. It is a lot easier to just toss the dirty wipes in the diaper hamper and wash them, instead of having to separate out things into garage and diaper hamper. I spray a diluted soap solution on them before I wipe her down. There are a ton of fun recipes for things with lavender oils, etc, but if you wash them with your cloth diapers the oils will make the cloth diapers not as absorbent. I wash every 3rd day or so. I start them in a cold rinse/spin cycle (with out soap), then they go into a heavy hot cycle with an extra rinse. I am currently using liquid Seventh Generation detergent.I tried Rocking Green powder detergent, but didn't like the powder aspect of it. I have about 12 med/large G diaper inserts and 6 med/large G diaper covers that I use the most often during the 3-4 day cycle. Usually on wash day I go into my "back stock" of other random cloth diapers I have (but don't like as much as the G diapers). I think the hardest thing about cloth diapering is figuring out your "system", deciding what diapers you like, how many to buy and how to wash them. When you get that all worked out, it is so super simple and easy. I feel great about not throwing away all the mounds of disposable diapers and it is easier on the pocket book, too. ﻿"We've all been reeling with the images of tragedy and devastation in Japan. If you're looking for an easy, real, practical way to help relief efforts, then I invite you to contact your Close To My Heart Consultant! Typically, our A-sized sets retail for $7.95, but the "Hope for Japan" set will be available through April 30 for just $5--and Close To My Heart will be donating 100% of the profits to the American Red Cross to benefit relief efforts in Japan. If we all do a little, together we can do a lot. Let's show our support and together, provide real HOPE for Japan!" 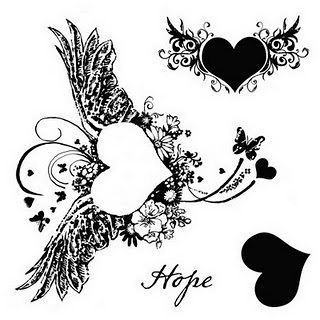 Let me know if you would like to order the Hope for Japan stamp set. Our first year in our new house, where we continue to work on a long list of projects. After each project that is completed the house feels more and more like ours. I simply can't wait for our new kitchen to be completed!! My fifth year as a Close To My Heart Consultant. I enjoy being able to show people the awesome scrapbooking and crafting supplies that CTMH has to offer. Hosting workshops and teaching people new techniques is so much fun. Through the years I have questioned if I want to continue being a Consultant. Each time I do that, I can't seem to imagine no longer having my hands in the CTMH company on some level, even if at times it is smaller then other times. We have now closed the chapter on our "Crying It Out" plan. It truly couldn't have gone any better. I am amazed by how in 1 night we went from Adalyn waking up on average 8 times a night to her waking up once a night! WHY: We chose to use the Cry It Out method with Adalyn because she was waking up SO MANY times during the night. Generally, she would go back instantly to sleep after being given the pacifier. But since she was up so many times it was hard for us to know which time she might be hungry, so we were also constantly feeding her. She would eat a little, but mostly just out of the fact it was being offered to her, NOT because she was actually hungry. She was just not getting solid chunks of good quality sleep and you could see it in her behavior during the day. WHAT WE DID: We decided that the pacifier needed to go. She needed to learn how to self-soothe herself to sleep with out using the pacifier, since it really wasn't working for her any way. We also wanted to cut down on the amount of times she was eating at night. HOW DID IT GO: Amazingly!! I know it is super hard to go into this whole "Cry It Out" thing with out knowing how long your baby/kiddo might actually cry. But the total amount of time that Addie cried/fussed was so minimal. The overall outcome of her being able to self-soothe herself to sleep, not use a pacifier any more and to only eat one time at night is worth the small amount of crying/fussing that happened. The stress that we were all under running into her room every hour or two to stick the pacifier back in her mouth (during the night and naps) was enormous. She is now getting good quality sleep, making her an even happier baby during the day. I truly believe that generally all kids can be good sleepers. I think that we (the parents) do things to make it harder for babies/kids to sleep. We take away their ability to learn how to sleep on their own. (I am talking about after the first 2-3 months as an infant). We rock them, use pacifiers, keep them up too late, keep them too busy during the day for naps, offer food when it is not necessary or needed, etc. All of these crutches do things that we think are easier for us or helpful to the baby/kid, but really they are just that...crutches. It's hard to take these things away and hear our babies/kids get upset. But the end result of a well rested child needs to be seen as the prize that just about anything will be done to reach. There are just WAY to many overtired, and sleep deprived kids growing up right now. And it is effecting their behavior and how they learn. I just read this article that has a lot of good thoughts in it. I personally don't want my kiddo sleeping with me until they are 2+ years old, but that doesn't mean you will have a bad sleeper on your hands either. It is up to each parent to decide what they are willing to "endure" and for how long. Thanks to Laura for hosting our March Craft Club! We made cute picture frames using punches, buttons and acrylic letters. This was a pretty quick and easy project that any level of crafter (or non-crafter) could do. The options of what you could make are endless! I made one for Adalyn's room. It is a little hard to tell in the picture, but the buttons are on the outside of the glass giving the butterfly some dimension. The acrylic letters are on the outside of the glass as well. I realized that her day time is a whole new ball game now. With her actually sleeping at night I have no idea when to put her down for naps. I hope today goes a lot smoother minus all the noise. 7:54am: She was a little cranky this morning and easily startled and crying. I didn't want to get her overtired again and the morning nap really sets the tone for the rest of the day. I laid her down hoping that she falls asleep easily and sleeps for a long time. She hasn't had a good nap yet with out a pacifier. 8:12am: After some fussing she fell asleep after 15 minutes. I may have waited to long to lay her down. Her sleep window is super "fragile" if you don't hit it just right it has always been harder for her to fall asleep. I'd say at this point she is past the need for the pacifier and acting like her "normal" self. 8:47am: Wake up...short, yet again (and no noise!). Overall today's nap represent a fairly normal nap day for her. Addie was super overtired from her rough nap day today, so I was extra nervous about bedtime. 5:25pm: Kenny put Adalyn down for bed. (I am gone picking Mema up from the ferry, so I missed out on all the crying). She didn't take it so well, but that is normal for her even with a pacifier to have a harder time going to sleep when she is overtired. This just slightly longer and was a little louder. 6:10pm: Sadie barks and startles Addie awake. I go into comfort her. She goes right back to sleep with out a peep. 7:15pm: We hear her transition at the 1 hour mark, but unlike before with a pacifier she stays sleeping. Normally we would have had to run in and give her the pacifier back to have her continue sleeping. 12:33am: I hear a couple loud noises come from her room. But then nothing. I figure it is a transition, which is a normal sleep pattern. Something she never did before because she never got to a deep sleep. I lay awake just waiting for her to wake up. My sleep cycles area all messed up from getting up 8+ times during the night. 2:05am: She is awake. I go in and cover her back up and hope for a quick back to sleep. Plan A was to feed her 30 minutes after last night which wouldn't be until 4:30am. 2:15am: She is not going back to sleep. I confirm with Kenny and we decided to feed her since it is within our original feeding plan from last night. 2:47am: She goes back to sleep no problem. Fingers crossed it is until morning!! 6:15am: Good Morning, Miss Adalyn. You slept almost all night long with only one wake up to eat!!!! I am so proud of Adalyn and how well she did during the night. And proud of us for sticking to our plan. I have heard all the negative and positive thoughts on letting your child cry it out. It was a tough decision for us to go ahead and do this. But I knew that what was happening wasn't right or good for her. I have heard so many people say they couldn't do that to their kids, or it will "hurt" her. Each family and sleeping situation is unique. Until you have walked in the shoes of the sleep deprived family, don't judge. I asked the Doctor why there was so much bad press on this technique. She said their are just different ways for different type of parenting and temperaments of children. Obviously, our child wasn't making improvement with all the other things we have tried. We considered doing the more gradual approach with her (going in increments of 5 minutes), but I thought that would probably escalate her more and drag the whole thing out longer. 8:50am: Time for Adalyn's morning nap. Kenny feeds her and puts her down. Poor timing on our part, but we are getting new garage doors put in. The garage is right under Addie's bedroom. As the kiddo is trying to put herself to sleep there are LOUD noises happening below her. 9:05am: She is talking to herself with a tiny fusses on and off. No loud crazy crying though. 9:25am: All is quiet in her room (not below her room though). She seems to be napping. Fingers crossed the garage door guy doesn't wake her up now. 9:51am: Appears she has been woken up. Bummer. What to do now!?!? 10:15am: She is just playing and talking in her crib and I have to go pick Shane up from preschool in 45 minutes. Looks like Nap #1 is half success and half not so successful. 11:53am: Nap attempt #2 -- just quiet talking to herself. I am hoping the garage guy is now done with his loud noises. 12:10pm: No more talking. She is asleep with out a single cry. 12:30pm: Woken up by the garage door guy! GRRRRR. She cries her scared cry. I go in to comfort her. After a few minutes I decide there is too much noise and she is too awake. So I take her out of the nap. 1:21pm: Nap attempt #3 -- I move her into our room in the pack n play. I know she is super tired and it is our fault for all the noise. 1:30pm: All is quiet. So proud of her! 2:10pm: Awake....hmmm super short nap. 3:45pm: I put her in the ERGO since at this point she can't really nap because it is so close to the 5pm cut off time. She quickly falls asleep in there for a 30 minute snooze. Overall naps weren't so great today, but that was our fault with all the noise. They probably would have been bad even if she had the pacifier. Adalyn had her 4 month well baby check up today. The big question of the visit was what the heck are we going to do about this baby who doesn't stay sleeping (waking up 8+ times for a pacifier) and still eats a ton at night. Doctor said go cold turkey. We are going to have go to the cry it out thing! Nothing else has worked and we are really making no progress. I grilled her on my million questions: Is it going to hurt her? Will she still trust us? Is it bad for her? Can we do it more gradually? etc, etc. I totally trust and love our pediatrician. She said she had to do this with one of her daughters, as well. And yes, it will be hard, but we have to give Adalyn the chance to learn how to self soothe herself. Giving her a pacifier and bottle all night long isn't letting her learn this super important lesson. And her growth is wonderful, so there is no reason she needs to be eating as much as she is (or at all) at night. Kenny and I decide we may as well jump in. No reason to wait. So here we go. 6:02pm: After a quiet calm bedtime routine. I put Addie in her crib, while giving her a pep talk and shedding a few tear for what may be ahead of us. I tell her I love and walk out. Oddly, she started out cranky. Before I had even put her down she was fussing, which isn't normal for her. Either I kept her up to long or the shot from earlier in the day was bothering her or something else. But she was off for sure. Making me even more nervous to start this adventure tonight. 6:07pm: The non-stop crying starts to fade. She starts to take a breather in between screams. I ask Kenny if it is okay if I go in after 30 minutes. He says sure. I continue to busy myself around the house, while willing her in my mind to calm down and go to sleep. I tell myself over and over again this is for the best. She needs to learn how to self soothe herself. She needs to sleep better. I need to sleep better. 6:25pm: The breaks between cries are getting longer and longer. 6:30pm: The time hits where I had said I would go in and check on her, but she is almost completely calm, so I don't want to risk messing that up. 6:39pm: This is the last time I hear her cry. I stand outside of her bedroom door and can hear her breathing deeply, but she is quiet. Could this really be it?! 7:25: Kenny and I pondered what the night will bring. She normally wakes up at the 45 minute mark, which is when we normally give her the pacifier back. We wonder if she will wake up and start crying all over again. Shane has gone to bed. We certainly don't want him to wake up. I am so nervous for the night and what may happen. 7:30pm: We hear a little cry and stop in our tracks. It has been 45 minutes....what is going to happen?! We hear nothing more....she stays sleeping. This is huge!!! 9:14pm: Kenny and I head off to bed. Earlier we had decided that we didn't want to not feed her all night long. Last night she had gone 7 hours with out food. So we decided that after 7.5 hours we could/would feed her if she woke up. With the plan of continuing to move this feeding out by 30 minutes and smaller for the next week. 10:40pm: Adalyn is awake. Talking to herself. I go to her room say "hi", cover her up and walk out. She protests loudly. This would be a normal time for her first feeding of the night. I lay in the hallway by her door with Sadie. Praying she stops protesting quickly. With a combination of talking to herself, crying, and her "trying to go to sleep noises" she is quiet on and off. 10:52pm: No more crying, just kicking every now and then. I then kick myself for not putting her in a sleep sack because I am sure she has kicked her blanket off of her by now. 11:20pm: Still quiet...I tip-toe into her room and oh so quietly cover her up. I am greeted by some noises and freeze in my path hoping they stop quickly which they do. 11:28pm: Back to bed I go. Let's see what happens next. 3:24am: Two quiet noises come from Addie's room. Do we feed her? Do I go in and check on her? She is quiet, so I do nothing. 4:10am: She starts talking and playing in her room. I decide to go in and feed her. I am greeted with smiles and I am so happy to pick her up and kiss her. All is well. She eats and falls right back to sleep with out any fussing. 7:00am: Addie wakes up a happy little camper. Adalyn Makenna is celebrating her 4 month birthday today. Her legs are getting much stronger and she is reaching out to grab things. Sometimes it seems like she is an octopus with her arms grabbing and reaching all the time. She has quite the grip, too (my hair has been pulled out a few times...ouch!). In an attempt to "celebrate" St. Patrick's Day. I colored Shane's milk green this morning and for dinner I made green pancakes. I tried to make them in a shape of a clover, but as you can see they don't look like shamrocks. But they tasted yummy. I followed the regular pancake batter recipe and added ricotta cheese for some extra creaminess and protein, along with cinnamon and vanilla. Making these pancakes extra yummy! Another wall has come down in our house this weekend. After our visit to the Home Show, we started getting estimates to start our work in the kitchen. Last week we found the company that we wanted to do our refacing/new cabinets in the kitchen and signed a contract. Super exciting! They start their work April 11th. We needed to get our portion of the work done before they arrive by taking out the wall and getting the electrical squared away. Now we just need to pick counter tops and purchase the flooring. A view of the wall from the dining room (the kitchen is on the other side of it). A rare opportunity was taken to draw on the walls by Kenny and Shane. They had it covered in people and airplanes. A view of the wall from the kitchen. After the wall has been removed. Looking into the kitchen from the dining room. After: Looking into the dining room from the kitchen. Where this wall was will be replaced with an island/bar or "kitchen nook/breakfast area" with cabinets. along with additional counter tops. Basically giving us twice the amount of cabinet space and counter tops from what we originally have. Adalyn is 16 weeks old today. There may be a slow trend towards more sleeping on her part. Slow, but progress none-the-less. 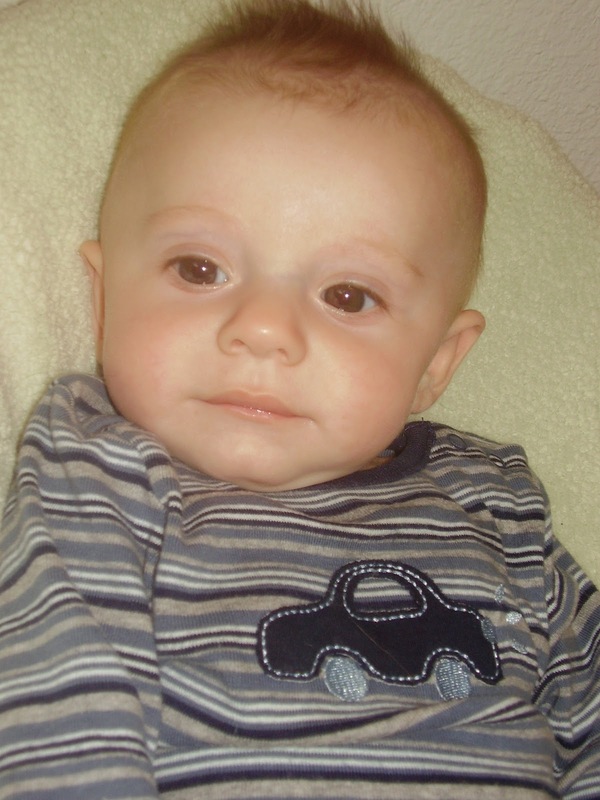 Shane was sleeping through the night at 16 weeks. I would have bet a whole bunch of money that Addie would have been sleeping through the night way before now. Guess I would have lost that bet. She loves chewing on her hands!